This is one of my favorite tartlet recipes. What is special about them, is the addition of poppy seeds to the crust. 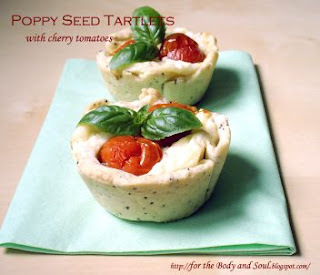 The poppy seeds give the tartlets incredible flavor, which goes perfectly with the sweetness of the cherry tomatoes. Besides, baked in muffins pans, these tartlets look absolutely adorable!!! The recipe has been adapted from Sarah Banbery's “Tarts” cookbook. Notes to the recipe : The original recipe called for cheddar cheese. I used Edam cheese in place of cheddar as it’s easier to obtain in Poland. Use what’s more convenient for you. You can also use cream cheese or quark instead of ricotta cheese in this recipe. Add the butter and rub together with your fingertips until crumbly. Add poppy seeds, iced water and form a dough ball. Roll out the pastry on lightly floured surface and cut out twelve circles ( 5 inches each). Transfer to muffin pan, pressing down gently. Cover with parchment paper and fill with a layer of dried beans. Refrigerate for at least 30 minutes before baking. Preheat the oven to 390 F (200 C). Remove the tartlets from the fridge and bake for 10 minutes. Take out of the oven, remove the beans and parchment paper and set aside. Place the tomatoes on a cookie sheet, drizzle with olive oil and bake for about 5 minutes. Melt the butter in a small saucepan, add the flour and stir until combined. Add milk, little by little, stirring thoroughly to avoid lumps. Bring to a simmer and cook for a few minutes until the sauce thickens. Add the cheddar cheese and stir to combine. Place two cherry tomatoes into each tartlet. Top with 1-2 tbsp béchamel sauce. Bake for 15 minutes.